SAN FRANCISCO, April 24, 2018 /PRNewswire/ -- Female Founders Faster Forward (F4) is increasing the venture capital (VC) funding for startups led by female founders from 2% to 20% by 2020. Female Founders, especially first-time minority founders, face systemic hurdles to VC funding — they lack the social connections to navigate the VC-funding process. 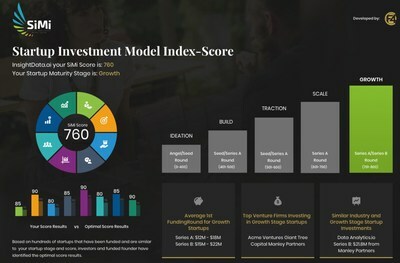 F4's Startup Investment Model Index (SiMi™) helps first-time minority founders get their first round of VC funding by objectively measuring startup maturity, opportunity, and risk while eliminating bias and prejudice in the VC-funding processes. Today, F4 released a Northeastern University research report that independently validates SiMi's methodology and analyzes the baseline data model across 752 early-stage startups. SiMi begins a new era in VC funding. SiMi (Startup Investment Model Index) objectively measures startup maturity, opportunity, and risk, while eliminating the bias and prejudice in venture-funding. SiMi is like a FICO Score for Startups. Much like the impact of the FICO Score on consumer lending, SiMi informs and empowers startup founders on venture investability — independent of gender, race, or other identities. SiMi assesses early-stage startups to level the playing field from the beginning. VCs struggle to evaluate early-stage startups because traditional metrics do not yet apply. SiMi's methodology is tuned for early-stage startups. It begins with an evaluation from the founder and/or investor of the eight core aspects of an early-stage startup. It then uses this initial feedback to identify the maturity stage of the startup. At each maturity stage, different factors become more important. In response, SiMi creates a weighted score based on the importance of these maturity-stage factors, then recommends the best fits for startups and investors. Overall, SiMi delivers an objective assessment of a startup and provides a SiMi™ Score, so that founders and investors can make better decisions based on measured analysis. F4 believes the SiMi Score will quickly evolve to be the FICO Score for startups, providing an easy-to-evaluate common language for gauging a startup's health and market viability. The SiMi methodology and baseline data analysis of 752 first-time funded startups was conducted by Michael Brown as his Capstone Project, a part of the Level program in collaboration with Northeastern's Experiential Network. Eliza Spang, Executive Director at Level, notes, "Sponsored by Northeastern, Level Education provides learners with high-quality, intensive, experiential educational programs that support them in gaining high-demand skills needed to advance their personal and professional goals. Our collaboration with Northeastern's Experiential Network enables Level students to engage in Capstone Projects with industry sponsors, like F4." "SiMi will transform how VCs fund early-stage startups because it creates an objective measurement of the startup," says Mr. Brown. His further analysis of SiMi's baseline data model of 752 first-time funded startups uncovered critical information about the VC-funding environment. "While there are not many female-founded startups, they compare favorably with their peers," he found. Second, at each stage of funding, different factors correlate to funding decisions. This validates the two-phase approach to the SiMi methodology. June Manley, Founder of F4, remarks, "Northeastern's validation of SiMi demonstrates the structural challenge in VC funding for early-stage startups. First-time minority founders specifically are not getting enough opportunity to be evaluated. To counter this, SiMi eliminates bias and prejudice from the process and helps first-time minority founders get an equal opportunity at funding." Female Founders Faster Forward (F4) is a nonprofit 501(c)(3) organization that is fundamentally changing how first-time minority founders secure early-round venture capital. F4 is developing SiMi™ as a registered 501(c)(3) nonprofit. SiMi will be available FREE to all founders and investors.